Register Log In ECN Forum Forums NEC & other Code issues Screen Room a 'Habitable Room' ? Does a Screen Room have to meet wiring requirements like the rest of the house? In other words, does it need a receptacle every 12 linear feet and within 6 foot of a corner like rooms "inside"? Yes, that's what I mean. If it matters, entrance to the room from the house will be through a 6' slider or double doors. Is there a choice to include or not to include wiring? Personally, I would tend to think that one of the "outdoor" GFCI recepts required would have to be near said door if this room is considered a porch... Otherwise, it's a room! When I searched for the term "porch" I found nothing, but did find information on a "sunroom"
210-52(a) -- says if its a "sunroom" that it needs outlets. 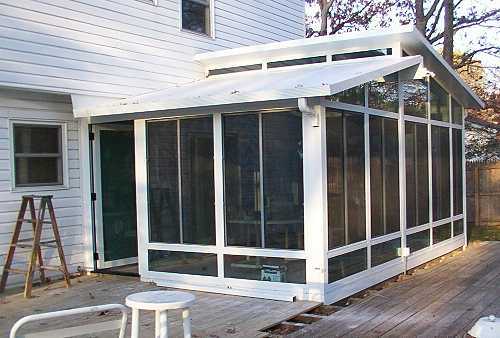 I think that this looks like a sunroom to me? I would think that weathertight and/or heated would come into the pix at some point to quailfy said room as 'habitable'. If in fact, this is so, then 210-70(A)(1) would apply. Also, if you were to eat there 210.52(B)(1) would 'similar area' mean 210.52(B)(3) are required?? I would consider the addition a screened in porch requiring only what the owner wishes to add in way of devices and lighting. I've wired many a new home lately and even though the screen porch could easily be wired to habitable room standards, they weren't required by any inspectors. It is getting skylights too at some point. This one will have a 6' section of electric baseboard heat and the wall common with the house will be sheetrocked as if it was an interior wall. As finished, it has 3 recessed lights, a ceiling fan, 6 interior receptacles and 1 exterior receptacle (all GFCI protected) and a set of floodlights at the rear peak. It will have the comforts and conveniences necessary when the room is in use. It will still be separated from the house by an exterior set of doors with weatherstripping, will only be heated when in use, and it is sitting upon a wooden-framed deck. Because of all the windows it was a challenge to find locations where the owner would agree to having (wiremold box) receptacles. There was no question as to them wanting power out there, but the amount of outlets and locations was a point of conjecture. An installation like this is clearly not of the same construction as the rest of the house and could be removed at any time without compromising the integrity of the house itself. (If the common wall was left with the vinyl siding (inside)) Does this have to strictly meet the requirements of the NEC for habitable rooms? Or, can they have what they want in this room? The "nightmare" house has a similar sunroom with WP ceiling fan, skylights, the works.... Shall I bite the bullet and add recepts and increase my loss?